For more than two decades, Nobu has delighted the palates of sushi lovers around the world, thanks to the culinary chops of star chef Nobu Matsuhisa and the Hollywood glitz of actor Robert DeNiro, who partnered with Matsuhisa in 1993 to open 27 swanky restaurants all over the world. Now, the restaurant has added a whole new element to its menu: a hotel. Opened in February in Las Vegas, the 181-room Nobu Hotel, located in the Centurion Tower of Caesars Palace, is a zen, Asian-themed oasis that offers a welcome respite from the perpetual pandemonium of Sin City. It's a bit hard to find – as is just about anything in the intentioned labyrinths of Vegas resorts – but the signage, which includes a Nobu Way notation and sleek, amber-lit columns, are good markers for the pocket-sized reception area. But, don't expect to rest weary feet here: There's no actual lobby, just a reception stand that's sure to get a little crowded at peak hours. But well-dressed staff members are efficient, and friendly, offering bottled water, checking guests in with iPods, and demonstrating how the button-free elevators work. They're a tad confusing at first but are ultimately pretty cool (one way to know you're in a property that caters to adults: when elevators don't have buttons for kid fingers to press). Designed by renowned architect David Rockwell, rooms are serene and soothing, with deliciously comfortable beds and 55-inch TVs that blend seamlessly into the décor. The spa-like bathrooms are a highlight, featuring teak elements, a black-tile shower, gray stone floor, and deep, egg-shaped white sinks. Plush towels and robes, as well as toiletries by Natura Bissé, offer a luxurious touch, and thoughtful extras include a bath mitt, wooden toothbrush, and take-home, black-and-white slippers so comfy you’ll almost consider trying to make them work on the Strip. But for purist Nobu fans, the biggest draw of the hotel is the insider access to its eponymous cuisine. Created by Matsuhisa himself, the room service menu is available 24 hours a day, plus, this is the only place where you can savor a Nobu breakfast; green tea waffles and an Asian take on the traditional bagel and lox are popular choices. Guests also get priority access (meaning guaranteed reservations!) to the gorgeous restaurant downstairs, which, at 12,775-square-feet and with 327 seats, and as many as 30 chefs working on busy nights, is the chain's largest restaurant. 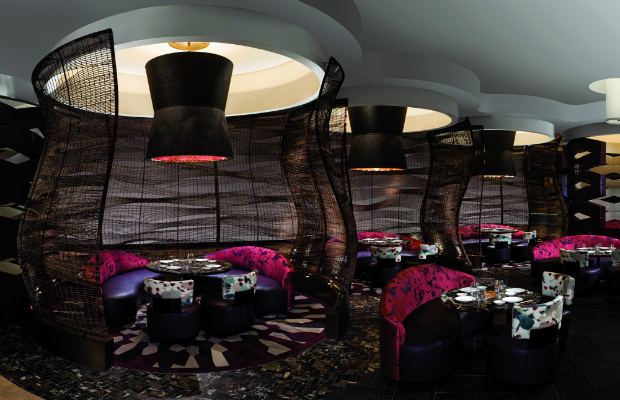 For a brag-worthy view of Vegas, however, Nobu is probably not the best bet. Most rooms look onto a concrete jungle with a limited view of the requisite neon skyline, and though they appear to feature a balcony, there's actually no way to access the outdoors. Rates start at an affordable $149/night mid-week and $259/night on weekends. Guests receive VIP access to the popular, on-site nightclub Pure, and for some serious relaxation, the Qua Baths and Spa, about a 10-minute walk through Caesars Palace, has added several Nobu treatments to its menu, starting at $175. A few minor gripes from my recent visit: I wasn't offered green tea upon my arrival, which is listed on the website as a welcome gift, and like just about every other property in Vegas, Nobu has opted to add a blasted resort fee (about $28) for access to the pool or to receive wireless internet. However, one notable perk that leaves a lasting impression is the chance to skip the sometimes serpentine cab line. Upon your checkout, a friendly Nobu employee will wheel your luggage through the casino right to the front of the queue. Which, after a few days in this crazed town, feels like hitting the jackpot indeed.